Imagine, if you will, having all the space you need for food preparation in your kitchen, a big enough area for cooking, and plenty of room for cleaning up. Further envision that all of this is separate from but close enough to your storage and dining areas, both of which are sizable enough for your usage for your kitchen remodel. It was not easy to achieve all this in the every kitchen design, particularly when so many of the plans are based on the 1940s-created kitchen triangle. Remember that the focus of the triangle is the sink, refrigerator, and stove, which should be arranged to form a triangle. The legs of the triangle are supposed to be four to nine feet and the total distance should be thirteen to 26 feet. A single cook was assumed. Current trends are moving away from the kitchen triangle to a zoned-approach . . . what is done in what areas and how much of it is done. . . prep, cook, serve, cleanup, storage . . . and how many cooks will be in the kitchen at any given time . . . along with kids, guests, and visitors. The cleanup zone would be your main sink area. There are must-haves that everyone needs at a well-designed cleanup zone. That is where The Galley® comes in as a perfect solution for your kitchen remodel. Now, we’re not talking about a galley-shaped kitchen, which consists of a single aisle. The Galley® is an innovative new way to design kitchens. 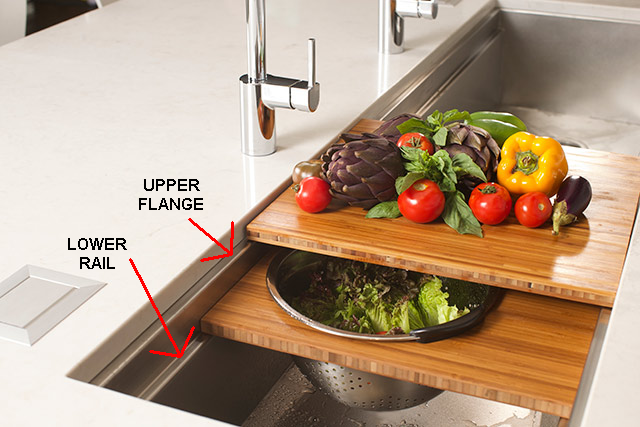 The Galley® is a kitchen sink like none you have ever seen before. The Galley® is a way to combine all of your work zones in a matter such that you have enough of each one. The Galley® is the modern way to set up your kitchen. The basis of the multi-configuration multi-function Galley® workstation is their U.S. manufactured 16 gauge 10” deep stainless steel sink called “The Swiss Army Sink” (Gold) by FineHomebuilding.com. The highest quality stainless steel is married with sound pads and a special sound-deadening undercoating for a quieter work experience. The Angel finish cuts down on reflectivity and provides for easier maintenance of the stainless steel interior of the sink. But what really puts this sink to work is its double-tiered design. The kitchen sink has an upper flange (lip or rim) and a lower rail upon which accessories can reside. And it is these accessories that turn it into a kitchen workstation. The length of the Galley and the type and number of accessories determine the configuration of and the functions provided by the Galley. They range from 22” to 80½“ long and come with a five-piece to eleven- accessory set (additional accessories are available). This allows for one through three cooks using the Galley at the same time. The Galley comes in four finishes: Natural Bamboo (shown above), Graphite Wood Composite, Gray Resin, or White Resin. What are these accessories? They’re all the normal things required for food prep, cooking, serving, entertaining, and cleaning up: cutting boards, platforms, bowls, colanders, and drying racks. Now, they are all in one place. In the Galley shown above, there is a cutting board and a bowl in a platform. Note that they can slide back and forth and be combined with other accessories. In the shot below, a drying rack and a colander are utilized. In addition to the accessories that come with each Galley Sink, there are many more available to completely customize your workstation experience. To help you create the perfect prep and clean up zone in your kitchen. The variety of Galley base sinks the differing finishes, and the variety of accessories insures that no matter what the cooking and entertaining style is in your home, there is a Galley for you. Pairing the Galley with an adjacent induction cooktop with an oven underneath brings more cooking into the picture. There are more possibilities available with the Galley. Contact your favorite kitchen designer, Bonnie Bagley Catlin with Signature Designs Kitchen & Bath, for more information about how to get your unique Galley kitchen.